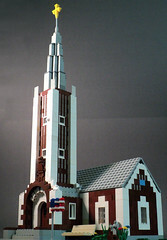 Brick Town Talk: Church - LEGO Town, Architecture, Building Tips, Inspiration Ideas, and more! I finally finished up my church yesterday and decided to take some pictures today. It used up practically my entire supply of basic brown bricks (which wasn't a lot in the first place), but I think it was worth it. There's no picture of the interior, as it's pretty bland, but I hope you all enjoy it! For more pictures, just head on over to Flickr. Fantastic. I'm jealous that youe are building. Look forward to seeing more. I actually haven't been building in awhile. This is actually the first thing I've actually built on all the way through to completion in a couple of months. I have this other MOC that I just keep rebuilding and making adjustments on. Hope you get back to build soon too. I really liked that last building you made.